Easier, faster, more secure payments. Now available with your Monese cards. Add your Monese card in just a few easy steps. It takes just seconds. All the advantages of a UK or EU Monese card, now in your iPhone — and without the contactless limit. 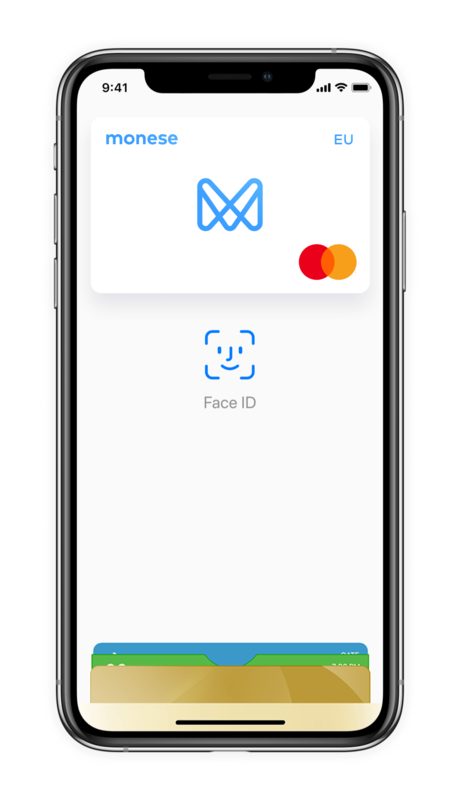 Monese payments are now made even safer using Touch ID or Face ID biometric recognition. Add your Monese card to Touch ID enabled MacBooks, and enjoy instant and secure payments online. To add your card to Apple Pay, go to the card screen in the Monese app and tap ‘Add to Apple Wallet’. Or, you can also tap in the Apple Wallet app. Where can I use Apple Pay? Can I use it abroad? Apple Pay can be used anywhere that accepts contactless payments - including shops, transport, hotels, restaurants and other vendors all over the world. Which devices does Apple Pay work with? * Mac: Mac (2012 or later) in Safari with an Apple Pay–enabled iPhone A full list of compatible devices can be found here (support.apple.com/km207105). How do I add my Monese card to Apple Pay? On iPhone, open the Wallet app and tap the ‘+’ sign. On Apple Watch, open the Watch app on your iPhone and select ‘Wallet & Apple Pay’, then ‘Add Credit or Debit Card’. On iPad, go to Settings, open ‘Wallet & Apple Pay’ and then select ‘Add Credit or Debit Card’.On MacBook Pro (with Touch ID), go to System Preferences, select ‘Wallet & Apple Pay’ then select ‘Add Card’. Simply hold and drag your Monese card to the front of your Apple Wallet. Can I continue to use Apple Pay if I lock my Monese card in-app? No. If you lock your Monese card, Apple Pay will disabled on all devices. Simply unlock your card to re-enable it. Apple Pay transactions do not limit how much you can spend. Some merchants do however apply a contactless limit and only accept payments of up to £30. No limits are applied to transactions made in-app and in the Safari browser. How do I stop getting two notifications for every payment I make? Both Apple Pay and Monese send notifications whenever you make a payment, meaning you’ll be notified twice by default every time you pay with Monese using Apple Pay. You can turn off Apple Pay’s notifications for your Monese card in your Wallet. Just go to the ‘back of pass’, tap ‘i’ icon on the bottom right and disable ‘transaction history’ in the ‘transactions’ tab. What should I do if I lose my Monese card? 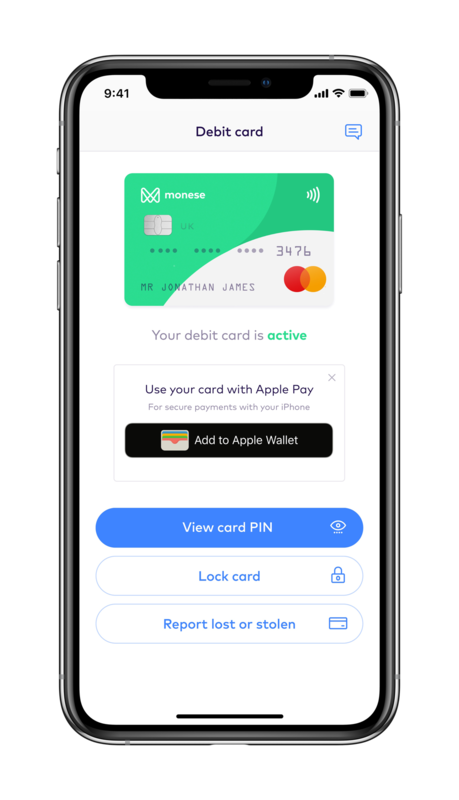 If you lose your physical card, you’ll likely want to lock your card from within the Monese app. This means you won’t be able to use your phone to make Monese payments through Apple Pay. If you believe you card to have been permanently lost or stolen, you can report this in-app - but you’ll still be able to use Apple Pay as long as the card remains unlocked. If you do need to order a replacement, your new card will automatically be added to your Apple Pay wallet once you’ve activated it within the app. Yes. When you use your Apple Pay to pay, your Monese card number isn’t included and isn’t sent to the merchant. Instead, a unique identifier is assigned, encrypted and stored safely on your device. Each transaction is authorised with a one-time unique security code. Can I use Apple Pay to pay in an app? Yes. You’ll be able to pay with Monese using Apple Pay in a number of apps.